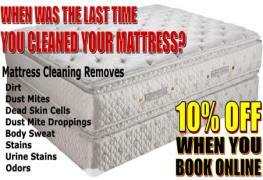 When was the last time you had your mattress professionally cleaned? Can't remember? Top Steamer, Inc. provides Miami area residents with quality mattress cleaning services, we use a powerful deep cleaning process to thoroughly clean & sanitize your mattress from dust mite droppings, dust mites, dead skin cells, dirt, sweat and we also remove stains caused by accidents like urine, coffee, soda spills etc. Mattresses have the highest concentration of dust mites in the house, one single mattress can have up to a million dust mites. It is recommended that you clean your mattress periodically to avoid allergies, remove dust mite droppings and dead skin cells from your mattress as well as urine odors or stains when accidents happen. We use a thorough 5 step mattress cleaning process to effectively clean and remove dirt, dust mites and stain from your mattress, leaving a much cleaner and healthier mattress for you. Before we start the mattress cleaning we inspect and advise you what to expect after the cleaning process. Sleep healthier in a cleaner mattress with Top Steamersm powerful deep mattress cleaning in Miami call us today 305-631-5757 to set up your mattress cleaning appointment no hidden charges, your satisfaction is guaranteed. See before and after pictures of our mattress cleaning service, in these pictures below you can see how the mattress have typical stains from accidents. You can see the stains in the before mattress cleaning picture and after the mattress cleaning difference. Click on picture to enlarge. Dust Mites are microscopic insects in the arachnid family that includes spiders, scorpions and ticks. They live their whole lives in mattresses, pillows, and in dark corner dust bunnies: hatching, growing, eating, defecating, mating, laying eggs. Dust mites do very well in fibers such as cotton and polyester; they cannot survive in natural latex and don't do well in memory foam, either. Allergy symptoms such as skin rashes and breathing problems are often attributable to dust mites. 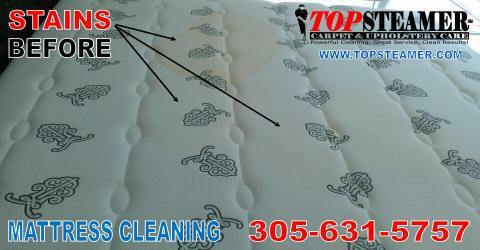 We also provide mattress cleaning in Fort Lauderdale. Cleaning your mattress periodically improves allergies and is healthier. Accidents happen if you have pets, small children, spills etc. Don't wait too long before getting your mattress cleaned. If the stain sits too long on the mattress, it becomes tougher to remove. Now remember if an accident happens don't try to clean or remove the stain yourself as you might create a bigger stain. Call us right away 305-631-5757 or book your mattress cleaning appointment online click on the following link Mattress Cleaner Miami. Mattress Cleaning Video You think your mattress is clean? Watch Video! 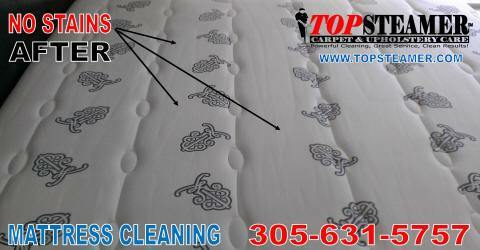 See a short video of a mattress cleaning service performend in Miami. Watch video to see actual magnified dust mites through a microscope and have better understanding about dust mites and why you should clean your mattress more frequently. Honestly, my phone died. They came no problem and knocked and were very professional. Within minutes of meeting they automatically went to work and left me blown away with the results! Best mattress cleaner hands down. My son had wet his bed several times over the past year and we decided to give the mattress a good cleaning. We heard about Top Steamer through Yelp. They were very professional and left the mattress like new. All stains were removed and it smelled great. My son was very happy and so was my wife. We will use them again for our couch.